Pretty amazing news from the company that refuses to die: ReplayTV will be launching PVR software for the PC that will ship with Hauppauge TV cards next year. 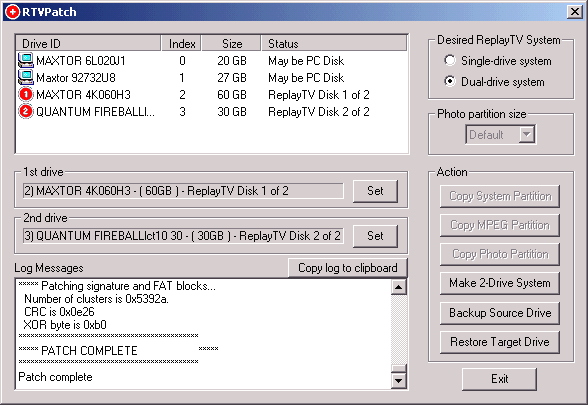 It's interesting to see a full service, hardware/software company like ReplayTV move into a strictly software realm. I'm curious what it will do to their profitability -- you can only make so much money selling $50 software packages compared to selling $300 boxes, though of course it's a lot easier to focus solely on software. Partnering with Hauppauge is a great plan, as they are the leading seller of TV cards for the PC, so ReplayTV will have instant uptake among Home Theater PC builders. Time will tell if this is a good move for the future of ReplayTV. Wired is reporting that an update to the DirecTV D10 receiver is causing problems for TiVo and ReplayTV owners. Apparently it's not always accepting commands sent over the serial port, causing some missed shows. The solution listed is to use the IR blaster, which can have the same problem as the one reported. The conspiratorially minded think that this update is just an effort on DirecTV's part to get them to buy receivers with PVRs built in. A DirecTV representative responds "I can absolutely say this is not a tactic to get people to switch over to another receiver," which is just the sort of thing you'd expect them to say if there were a conspiracy. The only TiVos I know that are capable of this entire featureset are what I would dub "ultrahacked" and are owned by electrical engineers and veteran software developers. But with ReplayTV and DVArchive, this kind of uber-functionality is as easy as installing a simple to use Windows program. They've just released the 3.0 version, if you've got a ReplayTV and a home network run, don't walk, to get this package. Poopli sounds like a long overdue service for owners of certain models of ReplayTV units. They used to allow the sharing of shows between friends, and Poopli helps turn strangers into friends by letting users request a program while the folks that have them can send their programs to others. I always knew ReplayTV had the chance to become a great big TV version of Napster and Poopli looks to be the missing part. Slashdot links to a discussion on FatWallet, AVS Forum, and InfoWorld about a new discount on ReplayTV units that was rescinded by the company on December 17th. It seems as if many retailers and many customers were led to believe that the units were to be dropped to $150 and that 3 years of service was to be free. In fact, documentation concerning the 3 years of free service was even in the boxes with the hardware. Whether this was an honest mistake or not, the corporate reaction by DNNA is a lesson in how NOT to treat your customers when one is a struggling manufacturer in a very competitive marketplace. Serial entrepreneur Anthony Wood (founder of ReplayTV, Dreamweaver, and other products) has started a new company to focus on the HDTV market. An HD PVR must not be too far behind, although I wonder about the HD space needed for HDTV. [Roku is] the first digital media player to be designed for high-definition televisions, which are gaining in popularity as prices drop. The HD1000 can play slideshows, video or music files from its four built-in memory card slots, or play files streamed from a computer via an Ethernet network connection. While TiVo hackers remember obscure linux directives, ReplayTV owners looking to add additional hard drive can enjoy a nice upgrade GUI for windows. The ReplayTV Hacking site is a great resource complete with FAQs and detailed instructions on using their upgrade applications. The ReplayTV hacking community looks pretty robust, with mpeg extraction programs, community forums, and community sites.